Alberto Ponis was born in Genoa in 1933 and studied at Florence University, where he qualified as an architect in 1960. In the early 1960s he worked in London with Erno Goldfinger and Denys Lasdun, where he came under the strong—and lasting—influence of the then-dominant modernist and brutalist movements. In 1964, he established his own studio, Ponis, on the island of Sardinia, and in the half-century since then he has built a remarkable number of private and public buildings. This beautifully produced volume is the first comprehensive monograph on this highly interesting and original yet little-known architect. It documents his biography, education, and training, then delves into his extensive research on Sardinia—which focused in particular on the typical housing types of the island’s rural areas. 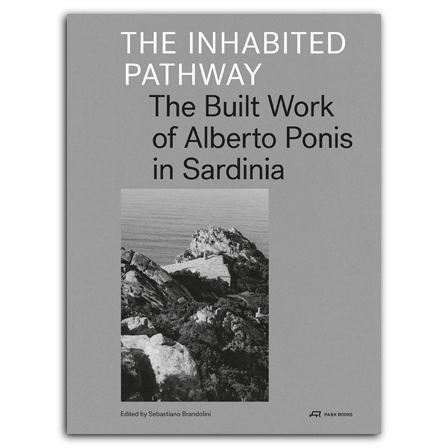 Detailed examinations of eight selected buildings created between 1965 and 1998 enable us to trace the evolution of Ponis’s work and philosophy, while a concluding essay offers thoughts on the essence of his architecture. , born 1959, graduated from the Architectural Association in London in 1982. He runs his architectural studio in Milan and teaches landscape architecture at ETH Zurich. He has been editor of the Italian architectural magazine/journal Casabella 1984–95 and still regularly publishes books and articles for journals and magazines. is an internationally renowned physicist, mathematician, and epistemologist, living and working in Paris. , born 1933, graduated in architecture from University of Florence in 1960. After working in London with Ernö Goldfinger and Denys Lasdun 1960–64 he established his own studio in Palau (Sardinia) and Genoa in 1964.